A Springboro, Ohio tea shop is targeting teens in addition to traditional tea aficionados. 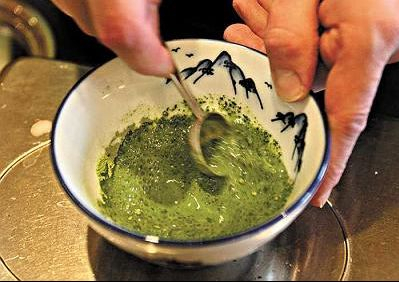 Gradually mix the Matcha powder with 1 to 2 tablespoons of the milk in a small bowl until smooth. Pour the remaining milk into a small heatproof bowl and sprinkle over the gelatin. Set aside for about 5 minutes, then place the bowl over a shallow saucepan of hot water and stir until dissolved. Let cool. Put the cream and sugar in a saucepan and heat over low heat until almost boiling. Remove from the heat and pour into a large glass measuring cup. Beat in the Matcha powder mixture, then the gelatin solution. Beat until fully blended. Pour the mixture into the teacups or cooking molds. Refrigerate for 1 to 2 hours until set. The panna cotta should wobble but they shouldn't look as though they are liquid in the center. If you have made the panna cotta in cooking molds, dip the bases briefly in boiling water, then invert onto plates and give one short, sharp shake to loosen them. They should drop out easily. If you've made them in teacups, serve as they are. Serves 4. The sign of a traditionalist: The above recipe calls for real powdered green tea, not tea bags.